Sausage dog owner and bespectacled gent aren’t necessarily the first traits conjured when the face of Great British art springs to mind. More recently the general public may reel off any number of the YBAs, especially with the recent success of Damien Hirst’s Retrospective featured in the Tate this year, but for me there is little else David Hockney could do to capture my heart as one of art’s, if not Britain’s national treasures. Where Hirst is grittier, edgier and can easily be imagined sloshing a pint, eating pork scratchings whilst starting an argument with; “at the end of the day” – Hockney is the more refined Yorkshire gentleman, who now at seventy five is like a wise grandfather; interesting, respectable and likely to carry Werther’s Originals at all times. Unlike my grandfather, Hockney a) possesses all of his own teeth, and b) is a renowned embracer of technology – his suits especially tailored to accommodate his iPad, his newest means of working. Friends of Hockney regularly wake to an electronically drawn bunch of flowers or the view from his window, now if that isn’t an innovative way to get art to the people I don’t know what is. If all this is sounding terribly twee then don’t be fooled. In his heyday Hockney, a bohemian and fun loving homosexual was like any artist in the sixties; skint, stylish and looking to make a break. As art became another aspect of culture it, in turn, offered a plurality of media, styles and technique which Hockney embraced using different codes and languages. At the time, abstraction in all its glory was the reigning force, (think Pollock), its dominance bullying artists and viewers into believing this was the way painting had to go. Even Hockney admits to being manipulated by abstraction, despite trying to “reject it in action” in theory he couldn’t reject it at all. After trying and failing to imitate the work of his adversaries’ large Abstract Expressionist pieces, a young Hockney followed suit. Hockney had now come to terms with his rejection of abstract Formalism, but this left the artist with a conflict of interest; he wanted to depict the figure and yet he shied away from traditional figurative art, conscious instead of the need to produce work which evoked the spirit of the times. 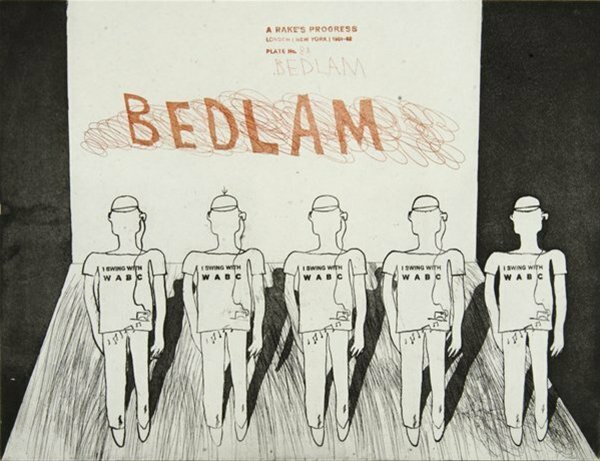 Still lacking the confidence to depict a real figure Hockney began to use doodles, scribbles and mere suggestions of the form combined with a use of text in some of his paintings, to try and denote the subject matter of each piece. This early illustrative style of Hockney’s can be seen in A Rake’s Progress (on display in the Peter Scott Gallery on campus from 1st October – 14th December), which is an adaptation of William Hogarth’s original series of engravings of 1725. The series tells of protagonist Tom Rakewell and his gradual decline from wealth to poverty to insanity –much like my experience as an undergraduate! Hockney’s version loosely echoes Hogarth’s narrative but adds a modern twist with the use of bold linear marks, limited colour palette and an absence of background and depth of field, allowing the viewer the intellect to imagine what isn’t there whilst reflecting the mental state of the semi – autobiographical character within the work. Ambiguous, interesting and created with the naivety of youth this series shows the early stages of one of the most established draughtsmen and biggest contributors to the contemporary art scene, produced in response to his first visit to the USA. If following Hockney’s advice that; “an artist should be judged by what he does rather than by what he says,” it is only just that you go and see for yourself.